This most interesting surname is of Old German origin, and is cognate with the English surname "Everard", both names deriving from a Germanic personal name composed of the elements "eber", a wild boar, and "hard", brave, hardy, or strong. The surname originated as "Eberhard(t)", "Eberhart" and "Ebhard" in the Thuringia region of South-West Germany, and was first recorded in the early 16th Century in German Church Registers (see below). The personal name found its way into France much earlier and was introduced into England in the aftermath of the Norman Conquest. Hence the English cognate of the surname, Everard, appears much earlier, and was the name of a Somerset family who trace their descent from Ranulph FitzEverard, who held lands at Luxborough in 1066, and Sir William Everard who was sheriff of Somerset and Dorset in 1258. 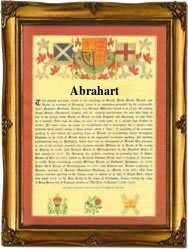 Aberhart/Abrahart is first recorded in England on November 12th 1712 when Christopher Aberhart married Jane Reditt at St. Botolph, Bishopsgate, London, whilst on July 10th 1791 Henry Abrahart, the son of John and Lucy Abrahart was christened at St Sepulchre, London. In German records Caspar Eberhard was recorded in 1523 at Zwichau, Schneeberg, Sachsen. In the 19th century, Anne, James, John, Mary and William, children of William and Martha Abrahart were christened between 1806 and 1811 at Epping in Essex. The first recorded spelling of the family name is shown to be that of Hans Eberhart, which was dated 1512, married Margaret Kormer at Chemnitz, Germany, during the reign of Emperor Maximilian 1, of the German Empire, 1493-1519. Surnames became necessary when governments introduced personal taxation. In England this was known as Poll Tax. Throughout the centuries, surnames in every country have continued to "develop" often leading to astonishing variants of the original spelling.